Microsoft has decided not to appeal against an European court order which will see sanctions enforced against the software giant. The EU sanctions compel the world's largest software maker to introduce a stripped down version of its Windows computer operating system. 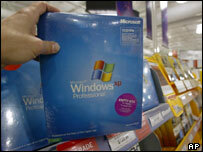 Microsoft will have to offer a version of its operating system without its own Windows Media Player pre-installed. In December, Microsoft lost its bid to delay implementation of the sanctions. Microsoft said the new version would be available "in the coming weeks". "Microsoft has decided to forego its right to appeal the Court of First Instance's...ruling of 22 December, 2004," the company said in a statement. The EU found that Microsoft had bundled its Media Play music and video software in with its Windows operations systems in a bid to usurp rival programmes such as RealNetworks's RealPlayer and Apple Computer's QuickTime. The ruling, back in March 2004, also came with a record 497m euros(£331m; $613m) fine, the largest Brussels has ever issued against a company in a competition case. The EU argued that Microsoft has abused its market position - nine out of 10 personal computers around the world use its operating system - to squeeze out competitors. Microsoft was also ordered to reveal details of its Windows software codes - to make it easier for rivals to design compatible products. Its appeal to suspend the sanctions was turned down in December, but it is continuing with a separate, main appeal against the Commission's decision that it abused the near monopoly of its Windows operating system. The software giant said it had already launched a website to provide rivals with information on how they can enable their products to better communicate with Windows-powered desktops. Meanwhile, the firm said it had been encouraged by the December court order which noted that a number of its arguments could provide a "basis for overturning the EC's decision". The Washington-based company said it expected to learn later this year when the EU Court of First Instance would hold a hearing on its main appeal.